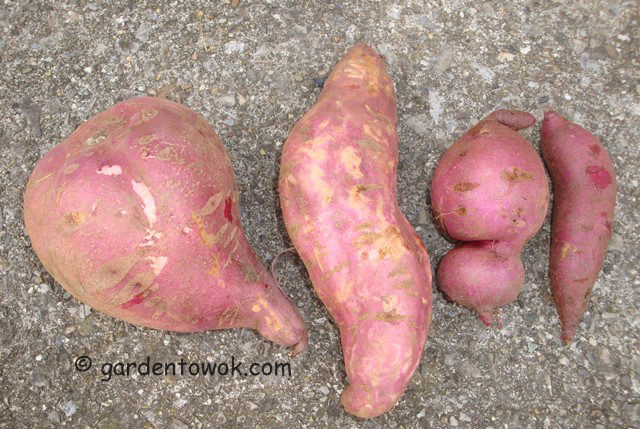 Did dig in my Purple Sweet Potatoes and Okinawan Sweet Potatoes before the frost and hard freeze but did not post last Monday because I had no photos. As the photo of the Purple SP below illustrates my harvest consists of different sizes and shapes, would be nice if they were more uniform but not complaining. The Purple SP on the left weighed in around 2 pounds, the little one on the right weighed in at 4 ounces. July of last year I received a gift of Okinawan SP slips from Angie, The Novice Gardener. I did not succeed due to the late start. Decided to grow slips as houseplants over the winter so that I could try again this year. Will I succeed if I start early? From all that I have read the growing season in the Hudson Valley is too short for growing Okinawan sweet potato. But what if I start really early, like March? I actually started March 10, indoors. As you can see from the photo below, I succeeded. Got 5 good size Okinawan SP from 1 plant (planted 2 plants but one did not make it) the largest weighing 9½ ounces for a total of 2+ pounds. Not a huge success but not bad either. I am going to try again next year, putting one plant in a very large container (black if I can locate one) and one maybe 2 in the garden for comparison. Wonder how different the results will be? As the above photo shows, I managed to spear all 5 of the tubers. You see, the tubers of the Purple SP form pretty close to the soil surface and I assume it is the same with the Okinawan SP, so when I carefully remove a few inches of soil from around the base of the plant and saw no tuber, figured I had failed again so pushed my garden fork down to turn over the soil. Well the minute I did that I hit something hard and knew I had speared a tuber. Now you think I would be smart enough to get down on my hands and knees and use a hand trowel to see if there are any more tuber/s buried in the soil, but no, I continued to dig with my garden fork and speared all the tubers. I am not the brightest light bulb. 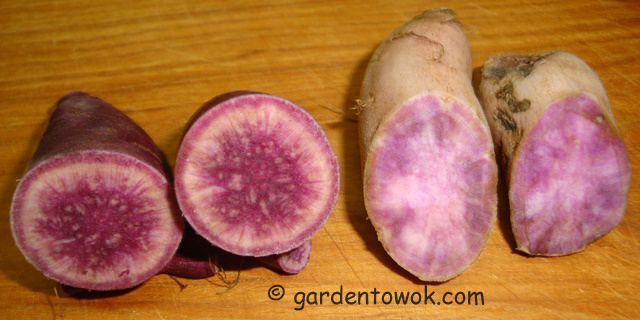 The 2 photos below are of uncooked and cooked Purple SP and Okinawan SP. Both the Purple SP and Okinawan SP are of the “dry flesh” type. I find the Okinawan a tad drier than the purple. Both are tasty. Planted my garlic, again only planting 2 varieties – German White and Duganski. For garlic planting how to, visit Cornell’s Vegetables Growing Guide – Garlic. Each head of the German White is made up of 5-6 large/huge cloves, each head of the Duganski is made up of 10-12 small cloves. 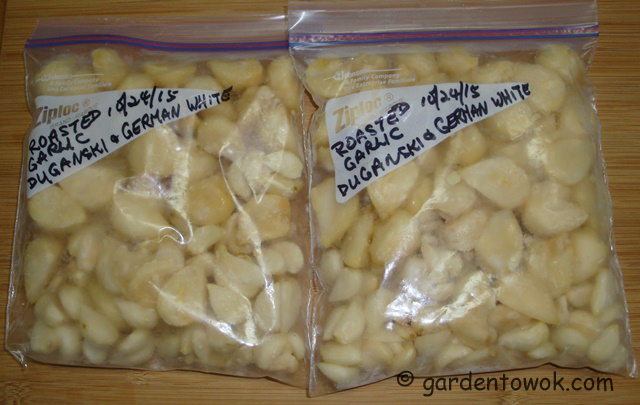 As you can see from the above photo one clove of German White is the equivalent of 2-3 cloves of the Duganski. Had a bit of time on my hand and was in the groove to put up some of my remaining garlic into the freezer. But before I do that I had to separate & peel each clove, roast them, cool, do an IQF (individual quick frozen), pack into freezer bag, date & label then return the filled bags to the freezer. The above is only ¼ of the amount I needed to peel. 1. 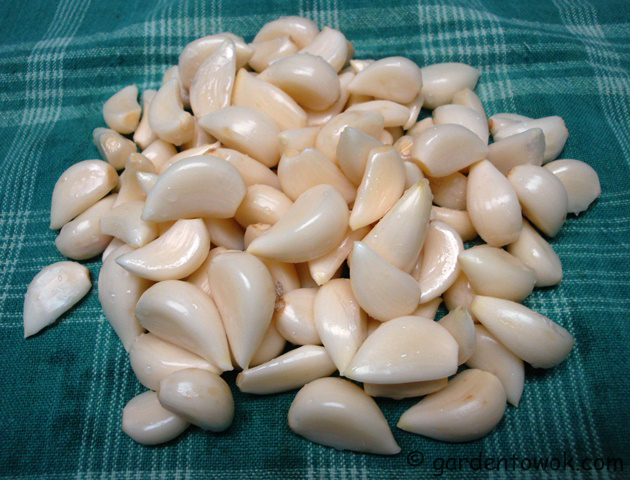 Place garlic cloves in a container and cover with luke-warm water. 2. Allow to soak for at least 5 minutes. 3. Drain and peel. If the peel is not coming off easily, soak a few minutes longer. 4. Rinse and drain peeled garlic cloves. 5. Spread on a clean dish towel and pat dry. 1. 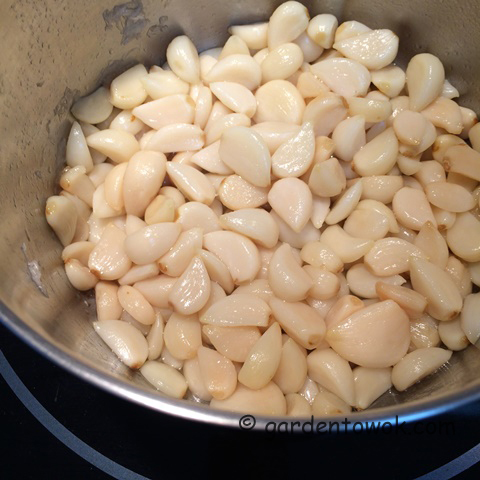 Place peeled garlic cloves in a heavy bottom pot/pan. 2. Add oil to coat each clove. 3. Cover pot/pan and place on stove. Turn stove to medium low. 4. Roast on medium low temperature until garlic cloves are soft, shaking pot/pan every now and then to toss around cloves for even roasting. NOTE: Due to the different sizes, I roasted the Duganski and the German White separately, the Duganski took about 30 minutes the German White took about 45 minutes. 5. Spread roasted and cooled garlic cloves, single layer, on a plastic lined sheet pan. 6. Cover with plastic and place in freezer. 7. Once frozen, transfer to freezer bag/s, date, label and return to freezer for future uses. I combined the roasted Duganski and German White and filled 3 quart-sized bags. This should hopefully last until next year’s harvest, doubtful though. There are endless uses to frozen roasted garlic, add to stir-fry, sauces, stews, dips, spreads, …, and because the cloves are IQF it is easy to just take out the amounts called for in recipes. Two or maybe it was 3 years ago Mac, High Desert Garden, gifted me with a few Goji sprigs for rooting. 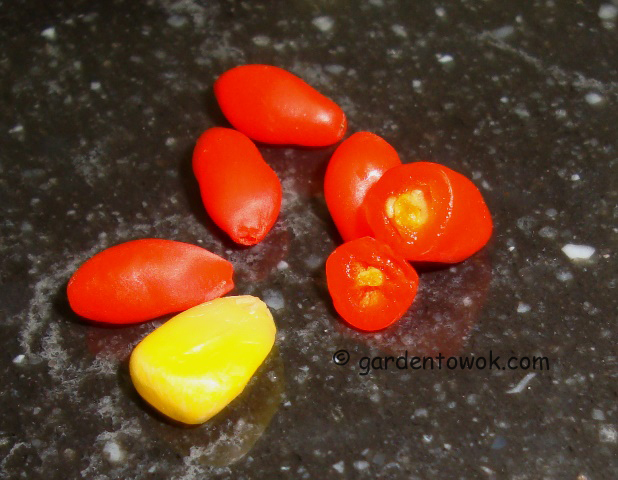 They not only rooted they flourished in my garden and this year I am harvesting a few fresh Goji berries. The plant survived the recent frost and hard freeze so I guess it is very hardy, the plant also tolerates shade. I don’t know much about using Goji and would welcome any feedback and suggestions. Understand both the leaves and the berries are supposed to be good for ones health and has anti-aging properties (wondering how much I need to consume to get rid of my wrinkles)? Tasted the berries, they are slightly sweet/sour kind of tomatoey flavor and leaves a slight medicinal aftertaste (not unpleasant) in the mouth. That is a kernel of corn next to the Goji berry. The yellow spots in the cross sections are seeds. I counted 7 seeds. Completely forgot to harvest my Asian pears before the hard freeze and lost all that were on the tree, which was most of the crop, ah well lesson learned, will remember next year. This entry was posted in Cooking, Gardening, Growing sweet potatoes, Harvest Monday and tagged duganski garlic, German white garlic, goji berries, Okinawan sweet potato, peeling garlic, planting garlic, purple sweet potato, roasting garlic, wolfberries. Bookmark the permalink. Those roasted garlic are amazing!!! And very convenient to use. Hi Norma, I am a new subscriber and have found your current and archived posts to be so helpful and encouraging. A quick question for you: would you share what fertilizers you use? I am especially interested to know what you use with your edibles, as they end up in our food. Thanks very much in advance! All the best to you. Welcome. I use liquid fish emulsion fertilizer and Espoma organic garden tone granular fertilizer. Thanks for all that useful information on garlic processing. I bought and planted a bulb of German White, and was very impressed with the clove size. Now if only I can reproduce the results! Thanks for stopping by and taking the time to leave a comment. Glad you found the garlic information useful. I am sure your next crop of German white garlic will be just as impressive. I love roasted garlic but I never thought about freezing it. Thanks for the tip! 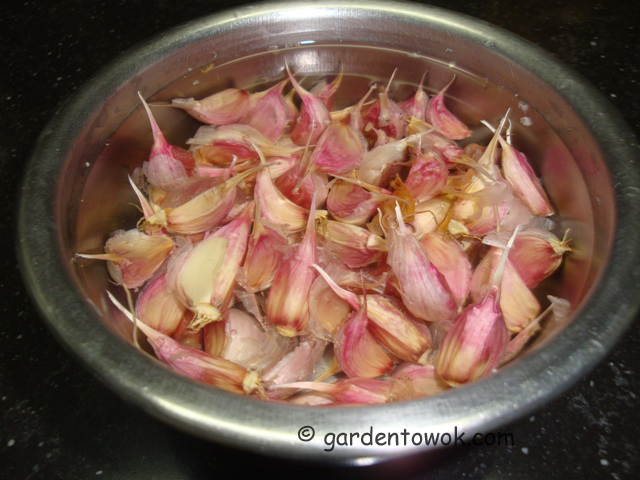 It would be a good way for me to preserve the garlic varieties that don’t keep as well. And I wouldn’t feel too bad about the Okinawa SP. When I grew them last year the tubers formed way down deep and I broke mine trying to dig them out. I know nothing about Goji berries so it will be interesting to see if you get some responses! You are welcome, being freezing roasted whole cloves of garlic for years, so convenient to use. I hope I get some feedback on how to use Goji berries and Goji leaves. Norma, congratulations on your success with Okinawa SP and goji berries. I am not sure what you were talking about with wrinkles! You are young! Thanks, you need glasses or contact lenses. Thanks so much Norma, so glad it is not some type of pesticide or something else… that is turning my garlic blue/green. I love that you freeze garlic! I would never have thought to do that. Someday if I ever get around to having a garden, garlic surely needs to be part of it. We eat so much of it! You sweet potatoes look delicious. I haven’t had one in a while. I’ll need to do that soon. It sounds really good to me right now. 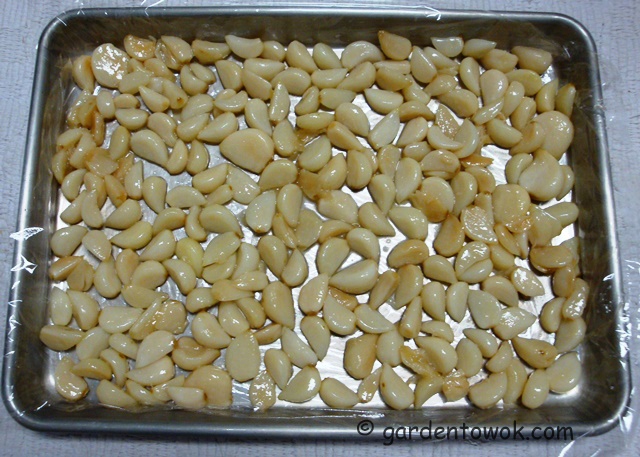 Been freezing roasted garlic for years, so convenient and easy to use, you will love it. I love garlic, this looks like a relaxing afternoon of peeling, sorting, and roasting, then quick freezing. I bet your house smelled amazing :0). How well do your sweet potatoes keep? It was just the mindless activity I needed at that moment to chill out. My sweet potatoes keep well through the winter but are usually all eaten by February. Oh that’s so sad about the pears – each year the garden provides us with some good lessons, doesn’t it. Your sweet potatoes are quite impressive – that one big sweet potato weighed in at more than all of mine…combined! Hopefully I’m lucky and one of these days I’ll be able to grow some nice big ones like you and Daphne – both of you have proven to me that it definitely can be done, even with our shorter season. I’ll be interested to see what you do with the goji berries – I see them in their dried form at the bulk food store but have no idea what they would be used for. You need to grow the short season variety of sweet potatoes. I am hoping to get feedback about using goji berries and the leaves. Yes, I got a good sweet potato harvest. You can buy purple SP at the Asian markets in Toronto, I have seen them at T&T. I just love the convenience of IQF roasted garlic, think you will too. I don’t think fresh Goji berries are available at the food markets. 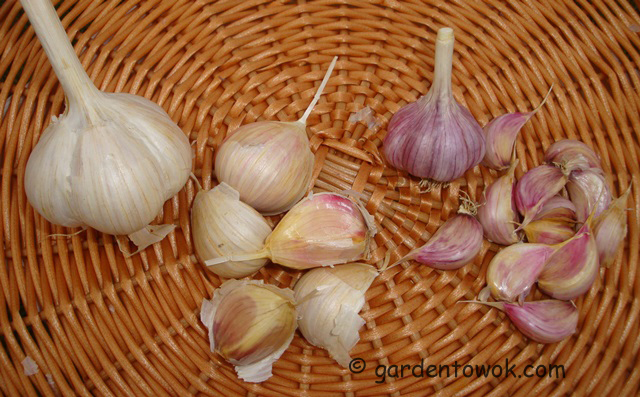 Hi Norma, I always learn something new when I read your blog, thanks for the info on roasting and storing garlic. You are welcomed. Always happy to know that my readers learned something new. Lovely, lovely garlic!! And I’m still impressed by the blue colour of your potatoes (even after cooking) from a previous post and here you are with such purple sweet potatoes! You certainly have chosen the right varieties. Just have to say that I’m glad my comments go through now and then, I seem to have a hard time with your blog and one or two other “wordpress” blogs. Terrific content always! I am glad too, not sure why you are having problem, will try to find out. Recently I have been choosing vegetables for colors and looks and find myself partial to blues and purples. 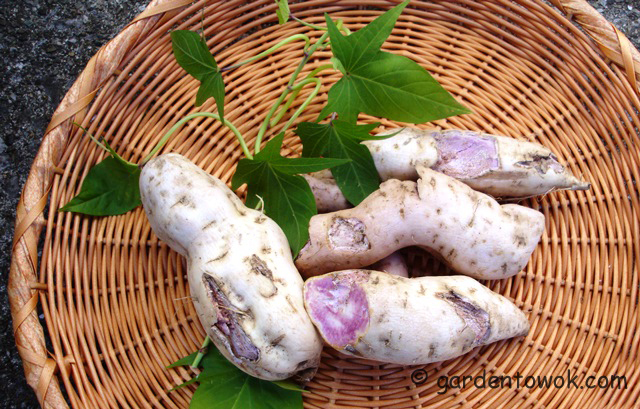 I love that you challenged your growing season and succeeded in getting a harvest of Okinawan Sweet Potatoes. I don’t think I would have the patients so peel all those garlic cloves. Although, it will be nice to grab what you need for cooking. I am hoping to do better with the Okinawan SP next year, will see. Peeling all that garlic actually wasn’t all that bad the soaking helped loosen the skins and made for quick peel. Thanks, happy to know you learned from my posts. To be on the safe side perhaps you could bring in a sprig of you Goji plant and grow as a houseplant over the winter. Your garlic is incredible. I have just put a sweet potato aside to plant, not sure where yet but soon. Are you planting the sweet potato tuber? If yes, it will not produce, you need to plant the slips that grow from the tuber. Send me a note if you have any questions. A beautiful week to you too. How do you make your salted garlic rub and garlic flakes? 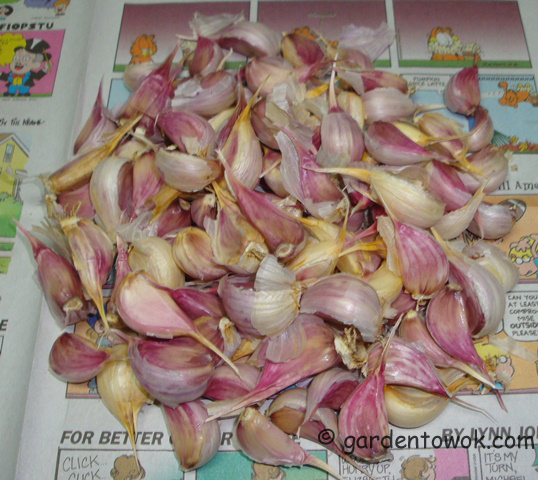 Your garlic sure stored well for an extended period, what varieties do you grow? What is your easy garlic peeling method? Both garlic varieties are softneck, not sure if they will grow in the Hudson Valley. Too late to order now but I will try and experiment next year. Let me know if my method work for you.